Located in Bradford, in the north of England, Ashtree are designers and manufacturers of mirrors and mirror arms. Our OEM customer base covers the bus, construction equipment, materials handling, agricultural, defence and specialist vehicle industries. Although we are UK based we have a thriving worldwide customer base. As well as a large range of standard, class II & III, rear view mirrors we manufacture many different styles of wide angle mirror. 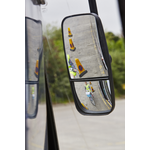 Used as universal mirrors on trucks, these products are also used on other machines to help eliminate blind spots. We also have many different styles of mirror arm which are designed for different applications in different industries. If our standard range of products doesn't have what a customer requires we are able to manipulate tube to a specific requirement. Mirrors and mirror arms for different types of vehicle and machine. The Ashtree OEM customer base is made up of many small to medium volume manufacturers. Wherever possible, we like to work with customers to develop a product and service that suits them. We have many long term customers and we like to think they come back to us because we offer a package of price, quality and service. We've been established since 1977 and in that time we have developed long term relationships with many customers. A typical Ashtree customer would be a small to medium sized volume manufacturer of machinery or after market spare parts distributors.